Apples mother walked out when she was a baby, for the past 11 years she has lived with her overbearing Nana and dreamt of the day her mother returns. When that day arrives Apple feels whole again. However just like that stormy Christmas Eve when her mother left, her return is bittersweet. Apple is confused about her mother, her friends and what is going on in her life. Then she meets someone who is more lost that she is, and a relationship builds that puts everything into perspective. Apple discovers something which can help her truly feel. What a story! I wasn’t sure what to expect from Apple and Rain but it wasn’t this. I expected it to be good and it really was, but the story, the issues tackled and the way it tackled them? well it just blew me away. I loved Sarah Crossan’s debut novel The Weight of Water, and I was kind of hoping for more written by her in verse. Unfortunately Apple and Rain wasn’t verse but it incorporated it by Apple getting in touch with poetry and putting her feeling into poetry a lot. I loved that this book gave that insight into poetry and what it can mean, and how it can change a person. I remember hating poetry at school but since I have found some I love I know what it can mean to a reader. This book put that across perfectly and I wish every school had a teacher like Mr Gaydon to help kids see that. The story itself was sad, and it tackled a lot of issues for a relatively small book. It did it well though with family break ups, health, and abandonment as priority and smaller, yet no less worthy, issues which included bullying, school problems and romantic relationships all having their own space within the book. I really loved what this book showed readers about maturity and growing up and how often the decisions we have to make are not easy ones and sometimes there is no right answer… yet we always know who to rely on if we just stop and think about it. I don’t want to go into the characters too much for fear of ruining the story. They are pretty much all of great importance and I could easily say something which will give the story away. I will say that they all invoked strong feelings in me, from the bully at school to Apples best friend, and her mother was the cause of quite possibly my strongest feelings of anger for quite some time. All of that was tackled brilliantly though and I think Sarah Crossan really does write some of the best contemporary UKYA. I couldn’t praise this book more and I really think it deserves a all the recognition it can get. It looks from the cover to be focused on romance, with the apple shaped into a broken heart but its so, so much more than that. Romance is covered but its nothing compared to everything else and I loved every second. 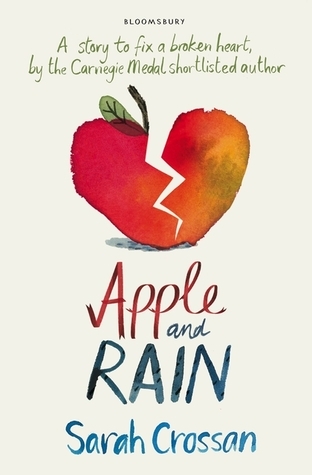 Apple and Rain will be published by Bloomsbury on August 14th. My copy was sent to me from the publisher in exchange for an honest review. Hadn’t heard of this before but it sounds really good, and that cover is beautiful! I too really liked The Weight of Water and enjoyed her dystopian novel Breathe, but Breathe’s sequel Resist I wasn’t such a fan of. Hopefully I’ll like this; lovely review!